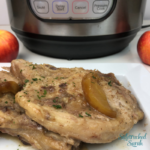 Instant Pot Apple Pork Chops are a Delicious Way to Get Dinner on the Table Quickly! They Are Tender, Juicy, and Have a Savory-Sweet Flavor Your Family will Love. We love Instant Pot Pork recipes! Some of our favorites include Super Easy Instant Pot Ham and Instant Pot Pork Roast and Gravy. Pork and apples are kind of the perfect combination. 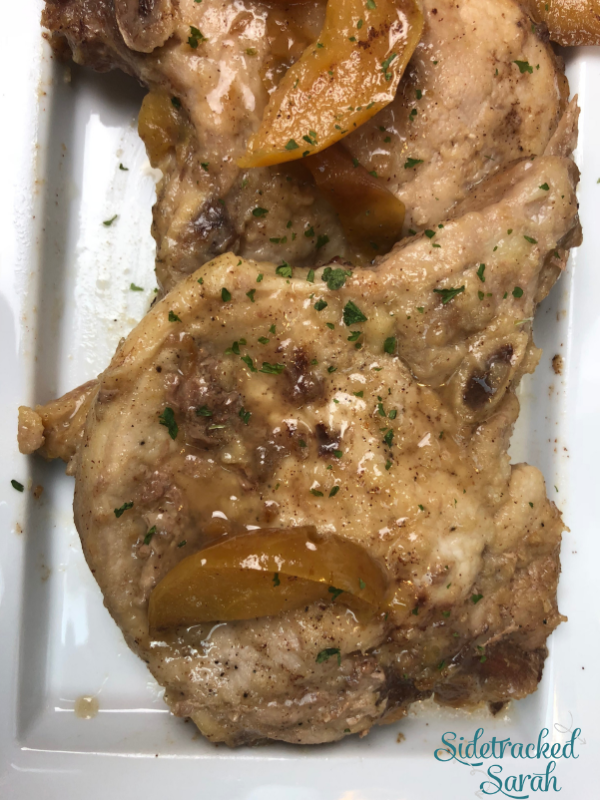 The mild sweetness of the apples just goes so well with the savory flavor of the pork chops! When you put them together in the Instant Pot, this combination is simply amazing. 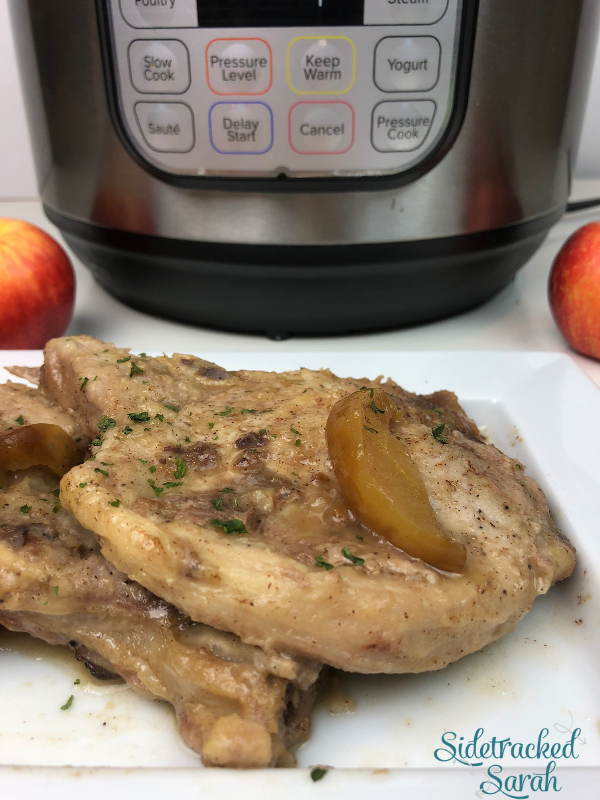 Pressure cooking cooks the chops quickly and seals in the moisture as well as intensifying the savory-sweet goodness of the apple “gravy.” It’s a meal your whole family will love! WILL THE PORK CHOPS STAY JUICY? Pork chops can be tough to make in the oven, since they tend to get tough or dry out. That’s why I love making them in the Instant Pot! A quick sear gives these chops an amazing flavor, and the quick cooking time keeps them moist, delicious, and juicy. The delicious apple sauce finishes off the dish! DOES IT MATTER WHAT KIND OF APPLE I USE? 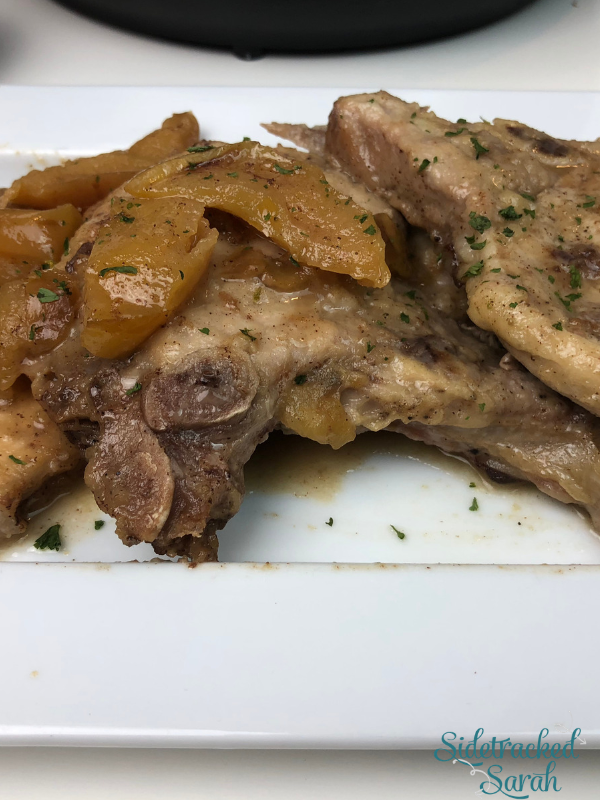 WILL INSTANT POT APPLE PORK CHOPS FREEZE WELL? These pork chops will freeze well! If your family is anything like mine, you probably won’t have enough leftovers to freeze, but you can do so. I would recommend adding a bit of apple juice or stock when you reheat them though, since pork can tend to dry out a bit. I hope your family loves this dish as much as mine does! It’s a great menu option all year long, and it’s easy enough to make even on busy weeknights. Enjoy! Season the pork chops with salt and pepper and then dip them in flour, making sure to cover both sides. Shake off any excess. Add oil to the Instant Pot and brown on Saute function for about 2 minutes per side, until they're lightly browned. Place the apple slices in the bottom of the Instant Pot. Sprinkle with brown sugar and cinnamon and then add the pork chops back in. Pour in the apple juice. Close lid and valve and cook on Manual/Pressure Cook, high pressure for 8 minutes. Natural release for 10 minutes, then release the rest of the pressure. Optional step: Remove the meat, turn the Instant Pot to Saute again, and cook the liquid down to make a thick sauce to ladle over the top. Last week was our towns annual festival. The kids enjoyed going to the carnival and seeing the parade. The parade was on Saturday and it lasts over one and a half hours. It is generally cold or mild at best for the end of October parade, but this year it was extremely hot. The temperature was only in the upper 70’s, but the sun was really hot with no wind. We all still enjoyed ourselves despite the heat. 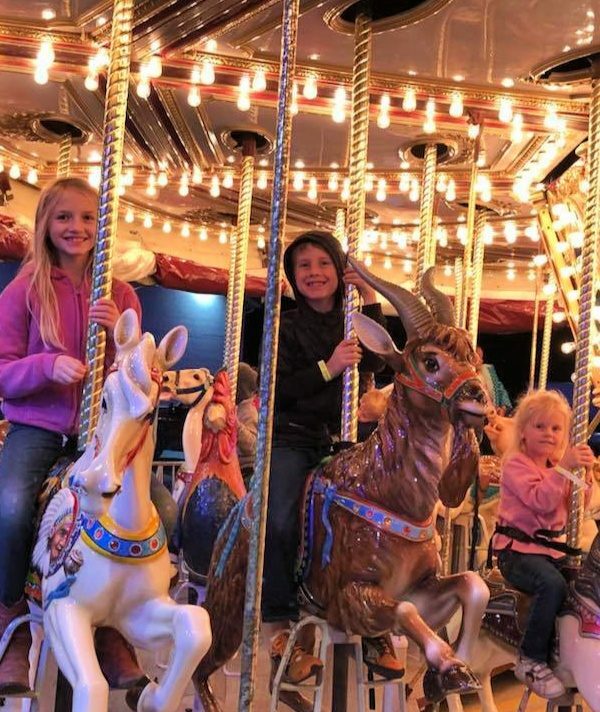 Pictured is my three youngest on a merry go round earlier in the week!